About meDeborah has been working as a clinician in the mental health field for over two decades. Deborah works with adults, both individually and as a couple. She has also provided many group therapy opportunities including her signature Women’s Twelve Week Empowerment Group. Deborah offers a broad array of creative tools to help her clients achieve their greatest good. Along with some of the cognitive tools shared in this book she also has specialized training in psychodrama techniques, which enhances her capability to creatively assist her clients. Deborah’s interactive style allows her to provide interesting and dynamic trainings and workshops. About my libraryBE HAPPY NOW! By Deborah Day, M.A. I am very excited to share with you about the release of my first book. I am a psychotherapist in private practice and this book emerged as a way for me express the many helpful tools I use with client’s to help them grow and achieve the change they want in their lives. This is a “good for anyone book”. I wrote it in a very short and concise manner. My hope is that it will motivate you to start or continue taking active responsibility for your life. The substitute is really the essence of the book: Become the Active Director of Your Life. No one else can make your life what you want it to be. You are the one who has the power to change and grow. 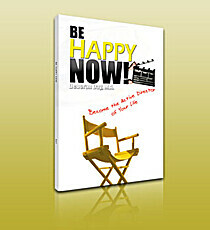 I hope this book encourages and motivates you to move forward in your life in the most positive and purposeful way. May healing and blessings be yours.